TS18 , TS19 , TS20 , TS21 , TS22 . Affordable and Quality Garage Services and repairs. We provide anything from just a General Service, Brakes (Pads or Discs), Clutches, Suspension, Exhausts, Knocks, Bangs or Rattles and use the Contact Form below , for a fast, quality & reliable service. Please leave a phone number and we can discuss what you require and how we can help . 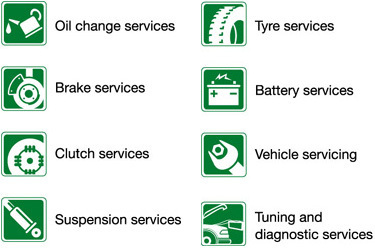 A motor vehicle service is a series of maintenance procedures carried out at a set time interval or after the vehicle has traveled a certain distance. The service intervals are specified by the vehicle manufacturer in a service schedule and some modern cars display the due date for the next service electronically on the instrument panel. The completed services are usually recorded in a service book which is rubber stamped by the service centre upon completion of each full car service. A complete service history usually adds to the resale value of a vehicle.